guess what? i'm going to Cosmoprof! i'm super excited, i've never been before :D i wasn't planning on going, but i got invited to Layla's (of the swoonworthy holos!!) cocktail party and i really wanted to go... so this way, i get to go to the party AND i get to blog on the conference! WOOHOO! 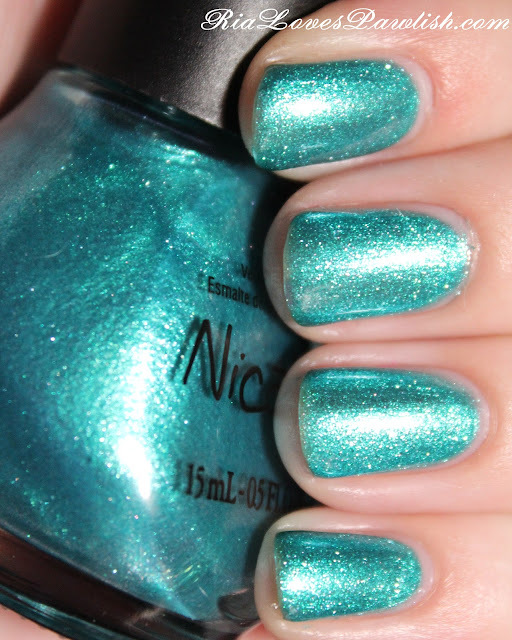 today's polish is Nicole by OPI Diva Into The Pool. it's a gorgeous teal foil that is super sparkly... it's really dynamic on the nail. the bad thing about it is the formula... it took three really thick coats for full opacity. the good news is, it didn't want to bubble or cause other troubles like that! it's especially thin at the tips of the nails, i think the Seche Vite caused it to back off even more. luckily, it's not noticeable in person! one coat Orly Nailtrition, three coats DITP, one coat Seche Vite. as usual with Nicoles... i love the brush, love the end product... not a big fan of the formula.